Holy cow! 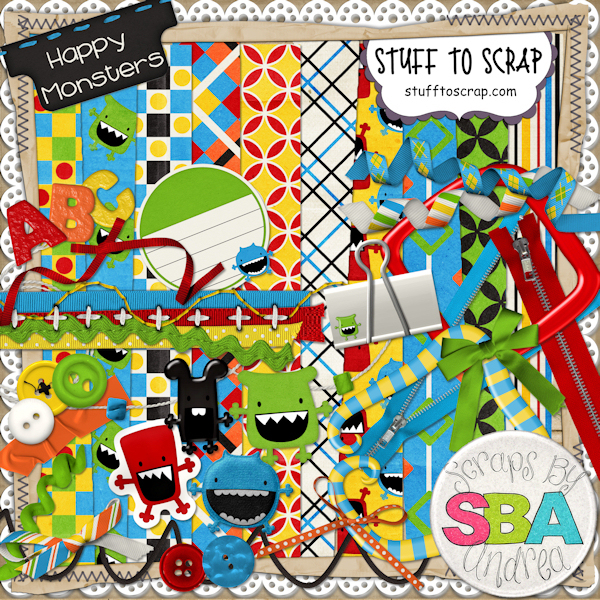 I had no idea that there was so much out there for DIGITAL scrapbooking! I just have to share my fabulous findings!! I spent last weekend at the beach, where I finished up our 2009 Family Album. I didn’t feel like I was lacking any products or designs, the digital kits from Creative Memories have been perfect, not to mention all the freebies they post on their website! 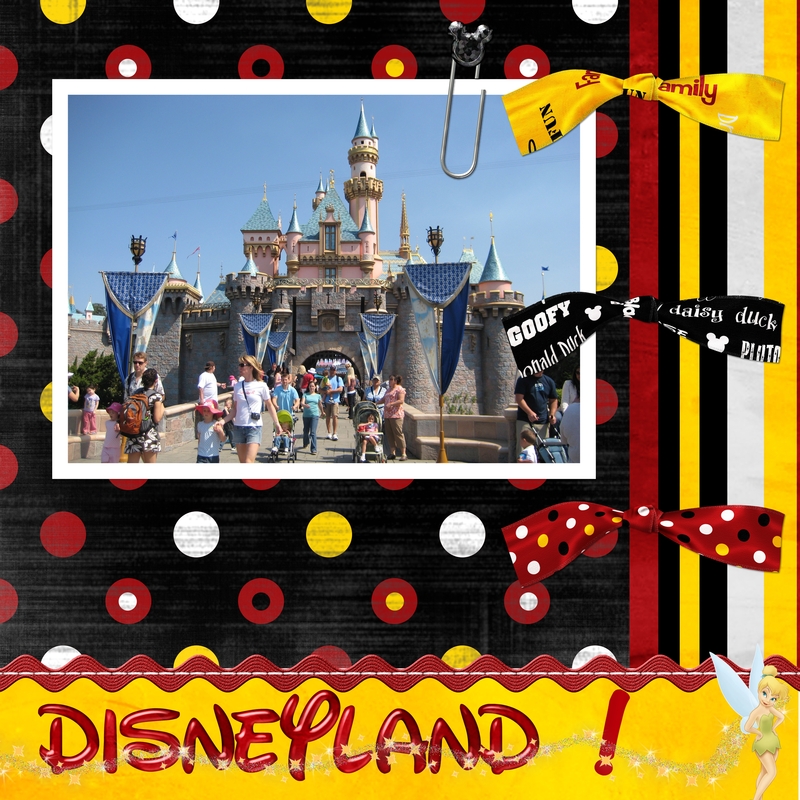 But after finishing my book, I decided to get a head start on my next book: our 2010 Disneyland Vacation storybook. 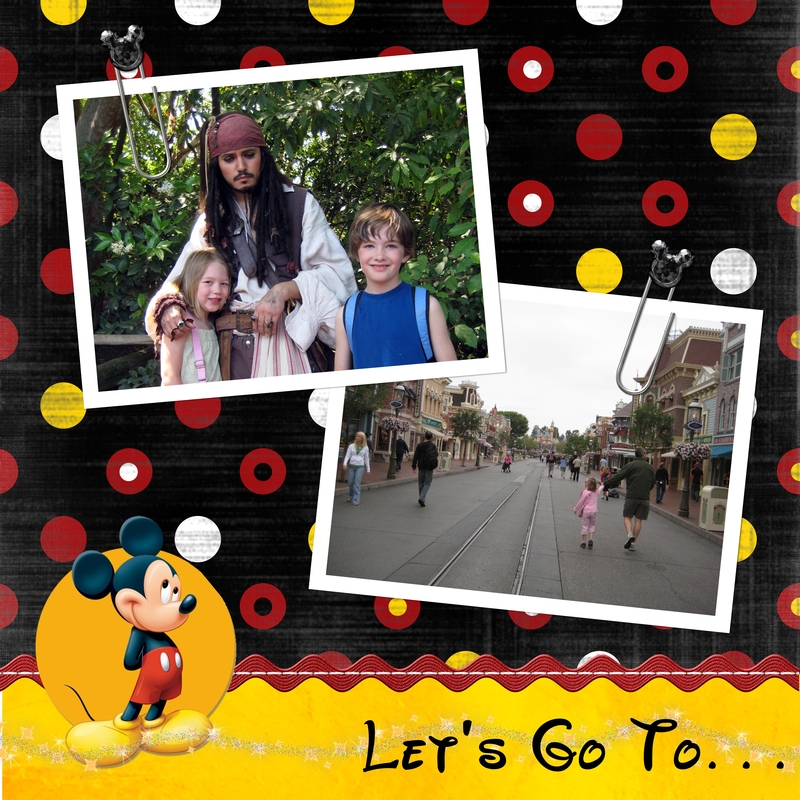 I made one in 2008, so already had some papers and embellishments from a Creative Memories pre-designed Disney kit that I purchased a couple years ago. But I didn’t want this next book to be identical to the last, and Creative Memories hasn’t released any new “Disney” themes for their digital software. Maybe they will this summer, who knows. 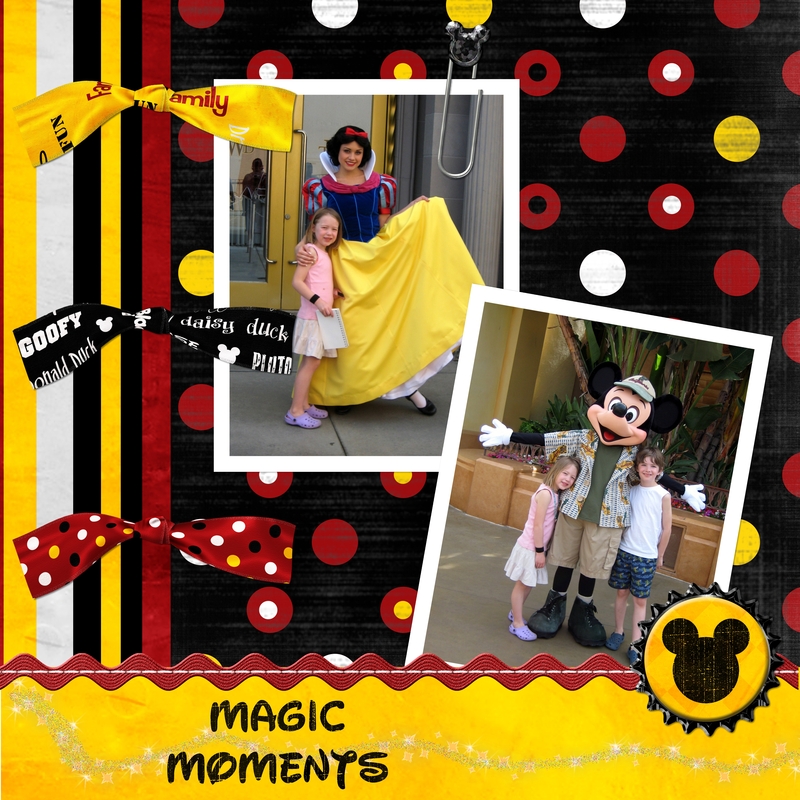 I had a grand idea of creating some wall frames for our front room that are Disneyland inspired to help excite the kids for their upcoming trip. I had ran across this page layout somewhere along the way and saved it. 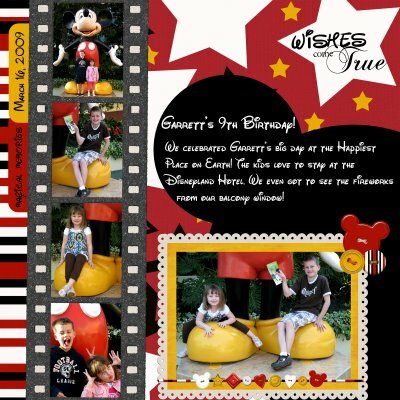 To create “MY” pages, I wanted paper similar to what was pictured above, but was hoping I could find red, yellow and black paper. Mickey Mouse colors! FUN FACT: Did you know that Disneyland’s street address is 1313, as in the letter “M” is the 13th letter of the alphabet. So 1313 is MM for Mickey Mouse? I believe the actual address is 1313 S Harbor Blvd, but don’t quote me. I digress. Looking for paper. First I did a google image search for “red black yellow striped paper” and found basically nothing usable. Then I googled “digital scrapbook paper” and found several websites that offered digital kits and packages for varying amounts of money, but I wasn’t sure they would work. Perfect! Exactly what I needed. Perfect colors, perfect theme! And for $3.99!! But would it work with my CM software? I figured $3.99 was low enough risk that if it didn’t work, oh well. Maybe I could still integrate parts of it with the CM software, it’s worth a shot. And it works!! Storybook Creator users: I created a new category under “My stuff” called “Dreamin” and added the files to that folder and everything moved into the right place when I opened my Storybook Creator Plus 3.0 software! Papers are under the Papers tab, Embellishments under the Embellishments tab. PERFECT! 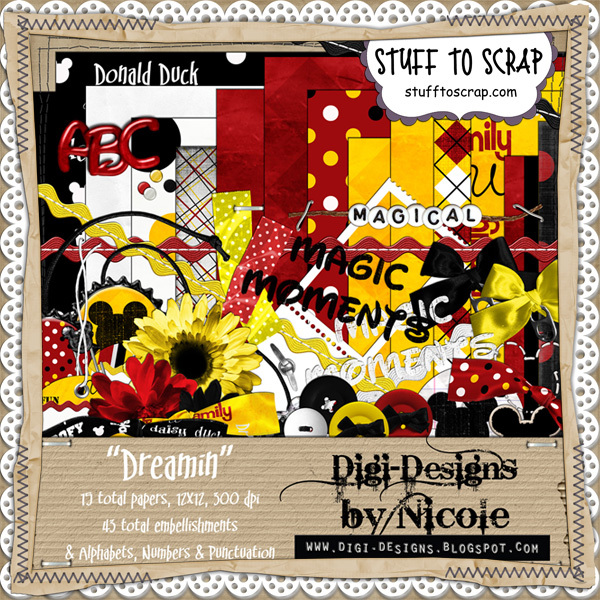 I’m so in love with this new digital scrapbooking find that I bought MORE kits! I can’t believe how inexpensive these kits are and they are so easy to use! Everything you see (plus more!) is included in these kits! 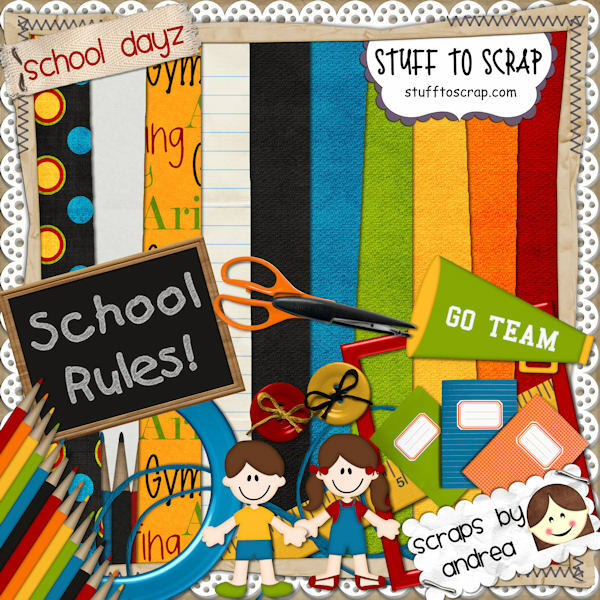 Multiple papers, stickers, alphabets, words, ribbons, lots of embellishments! And the website store has $2.00 Tuesdays!! You can buy many of the kits for just $2.00! That’s almost 1/2 price! Check it out….this is my new FAVORITE website!